Everyday, I start my make-up with a light serum. That's because I always stay at outside from early morning till late night, so I personally prefer a lighter coverage without feeling too heavy or burden, but at the same time helping me to keep my makeup last longer. It can be very uncomfortable if I feel my face has too much stuffs on it. So, my daily morning routine is very simple; starting with face toner, serum/essence, moisturizer, sunscreen, and then primer. In the past few weeks, I started to apply the new Rose All Day Oil-Free Serum from the Physicians Formula as my face serum. I've been introducing Physicians Formula in my blog before, I like their eye-shadow pallets, and of course their highlighters and bronzers are awesome too. 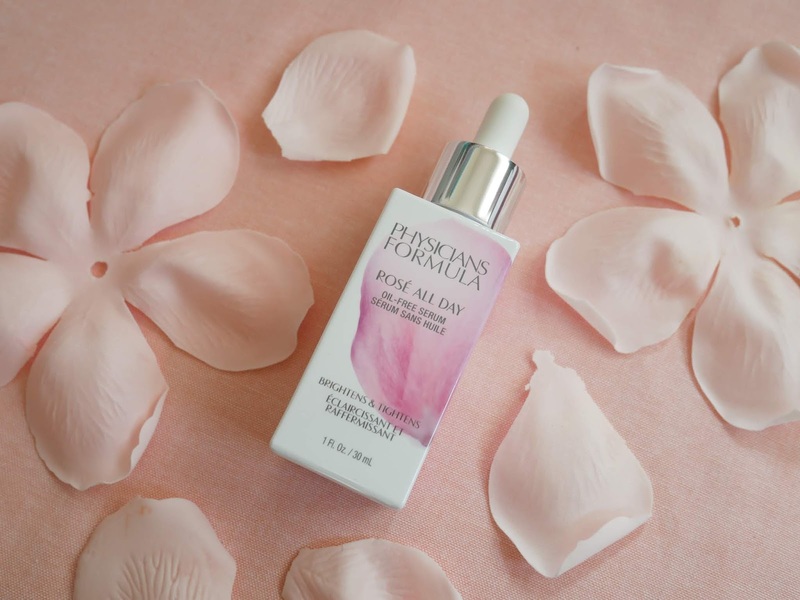 Physicians Formula Rose All Day Oil-Free Serum is a new brightening and tightening highlighter that they just launched in September. Some people might confuse if this product a highlighter or a face serum since the product comes with a name of serum yet it functions as a highlighter after all. So, today I'm here to talk more about it and also share my personal review about this new product from Physicians Formula. Rose All Day Oil-Free Serum @ RM65.94 (11ml) is an ideal skin care product for all skin types. It's a multi-use pearl scent formula that can be applied in a multitude of ways to enhance one's beauty routine. 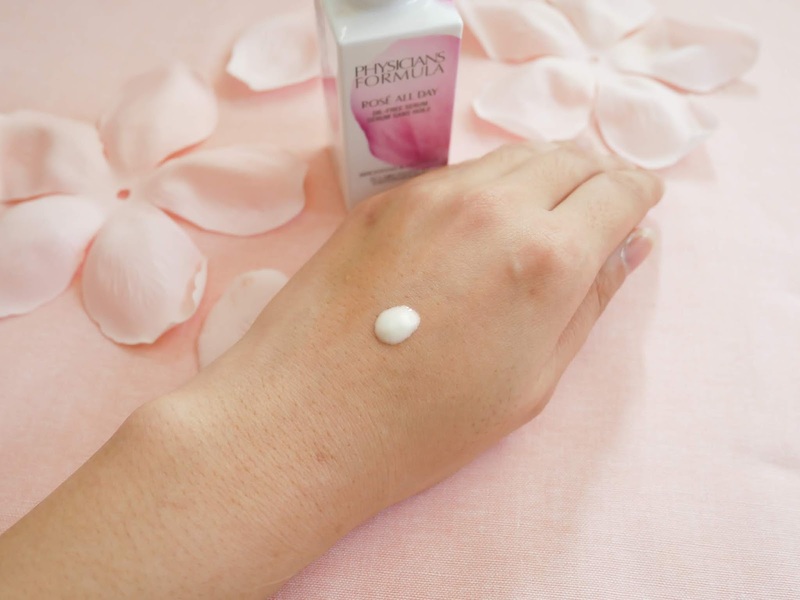 The serum enriched with calming rose water to help soothe, calm and hydrate skin. It also formulated with antioxidant-rich Goji and Kakadu Plum, which are the richest Vitamin C source of any other fruits. Besides, the serum also contains a tightening peptide blend as well. 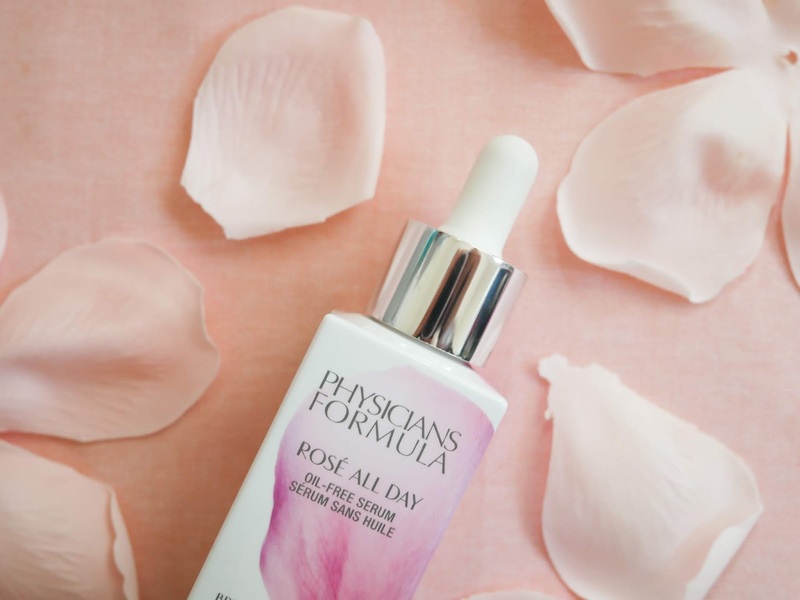 The Physicians Formula Rose All Day Oil-Free Serum comes in a standard dropper style bottle. The dropper bottle is really such a good way to control how much to use for your skin, however sometimes I just find the dropper is hard to dispense the liquids out. Not very sure if the serum is too thick for the tiny dropper or the dropper is not function well, it just not dispense very well enough. Btw, the bottle is in white colour with pink rose petals printed on the label. I think it's a nice way of presenting the serum because it really looks so beautiful on the overall presentation. It's a milky style serum. The texture looks quite greasy when I first opened up the bottle, yet it's very lightweight when I applied the serum on my skin. It provides very little moisture, and I think that's the reason it's not so creamy and sticky. 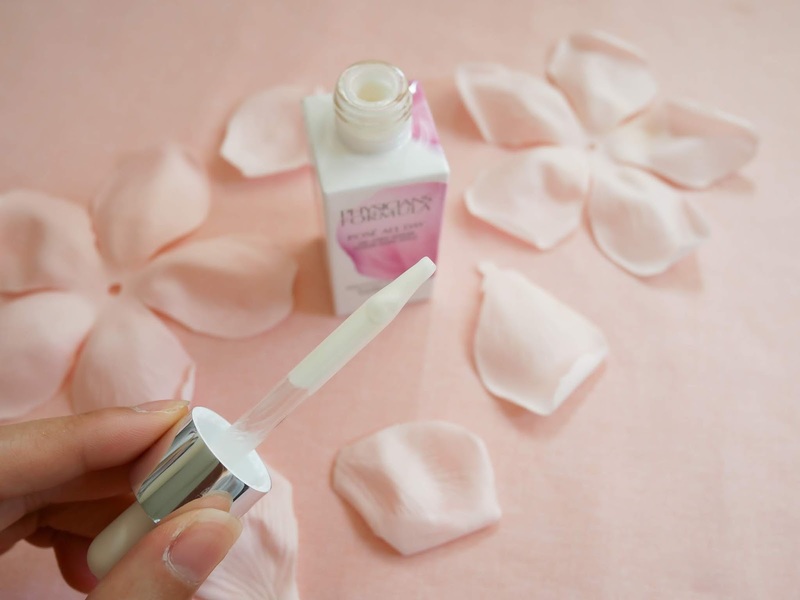 Rose All Day Oil-Free Serum can be used alone, under, or over makeup. You can use the serum as a face primer before applying your makeup, or you can also wear it alone along your daily skincare routine without any makeup. For myself, I use it before my daily makeup; one drop on each cheek, and then one drop on my chin and another drop on my forehead, then blend it evenly on my face. I always think that it's good to apply serums or primers to a cleaned face in order to keep your skin protected and also keep your makeup looking fresh all day. 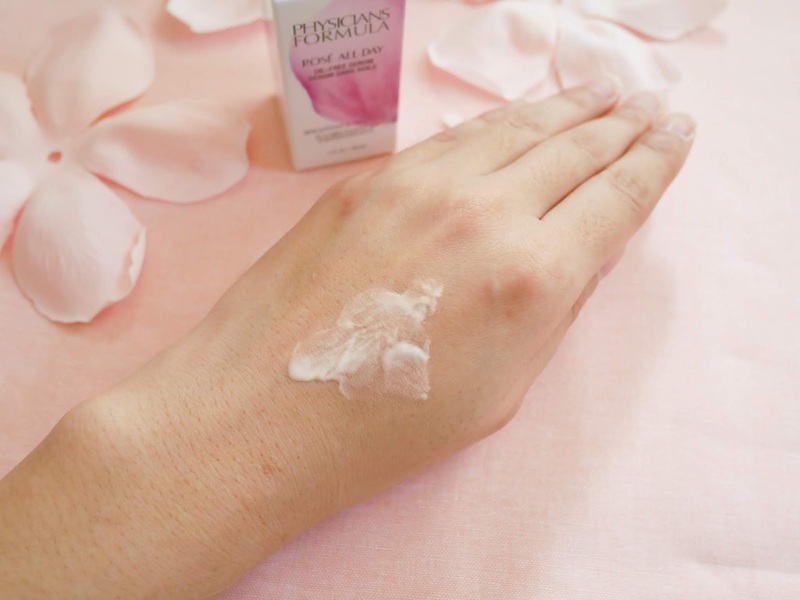 Rose All Day Oil-Free Serum is such a decent skincare product to treat your skin better without breaking the bank. I've been using for a week, and it doesn't cause any irritation or redness on my skin yet it helps to brighten my skin to have a better complexion, no matter if I'm with or without my makeup. However, I'm not very sure if this serum gives any tightening result on my skin since I didn't really notice the changes after a few application. I can't say it is a face serum to provide hydration, but I I would said this product works well as a primer or highlighter on giving a brighter complexion and keep my makeup well for the whole day. So, if you like minimal makeup, and looking an affordable primer or highlighter to brighten up or smoother your skin complexion, this might be an interesting product to try out. 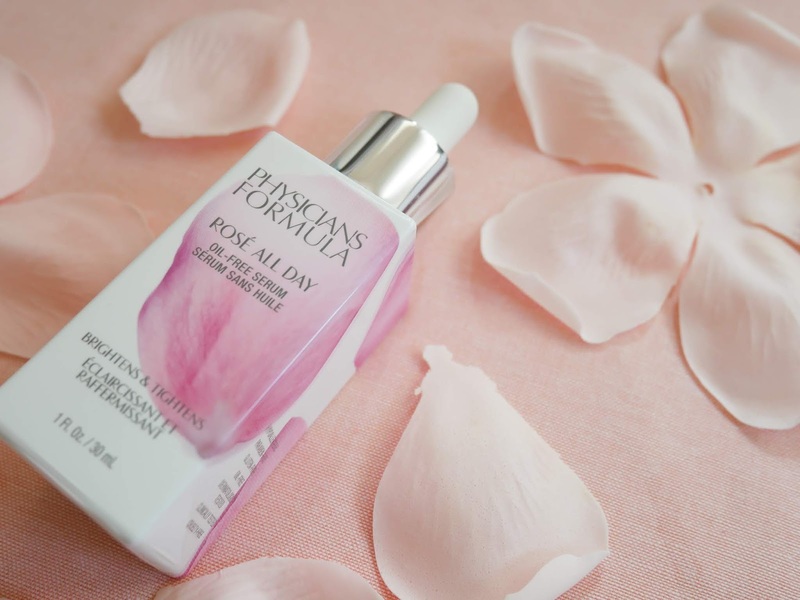 Physicians Formula Rose All Day Oil-Free Serum is now available at selected Watsons outlets, such as KLCC, Pavillion, Mid Valley, Sunway Pyramid, IOI City Putrajaya, Kinta City, Sky Avenue Genting, KLIA2 Gateway, KSL2, City Square.